The Oxford English Dictionary is the leading and most trusted English dictionary. With some 650,000 words, phrases and meanings, it offers the most comprehensive coverage of English everywhere it is spoken. Most of us will have used it at some time to look up the meaning of a word, to check a spelling or a pronunciation, probably referring to the Shorter version on our bookshelves. But the world has moved on since we bought that copy. What has happened to the big OED in the last thirty or so years? John Simpson was Chief Editor of the OED from 1993 until 2013. During his time there he devised and oversaw the revision and transformation of the dictionary into a resource fit for the 21st century by pioneering the use of digital technology in both its production and use. 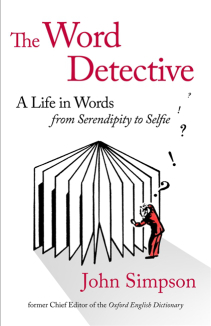 Now retired and living back in Cheltenham where he grew up, John lectures and broadcasts on the English language and the Dictionary and has written about words, language, and his life in lexicography in The Word Detective, which was published in 2016. The buffet lunch is available from 12 noon. The talk will start at 1.15pm and finish by 2.15 pm. The cost including lunch is £15.00; for the talk only, it’s £8.00. Copies of John’s book will be available to purchase at the event courtesy of the Suffolk Anthology bookshop. There are two ways to book and pay, online or by post. Please pay via online banking if you can, as this helps to keep our costs (and yours) down. Online: send an email to Jan Turner at jw-turner@hotmail.co.uk with Luncheon Club 157 in the subject line, stating how many places you require. Then transfer the correct amount to our bank account: sort code 30-91-87, account no 00005816, using LC157 plus your surname as a reference so that we can identify your payment. By post: download a copyof the booking form here. Send the slip with a cheque payable to Friends of The Wilson and a sae or clearly written email address to Jan Turner, Wold’s Edge, Station Road, Woodmancote, Cheltenham, GL52 9HN.